Sample Afterschool Enrichment Contract Form - from WSPTA - sample form that identifies what a PTA should cover when setting up an enrichment program. 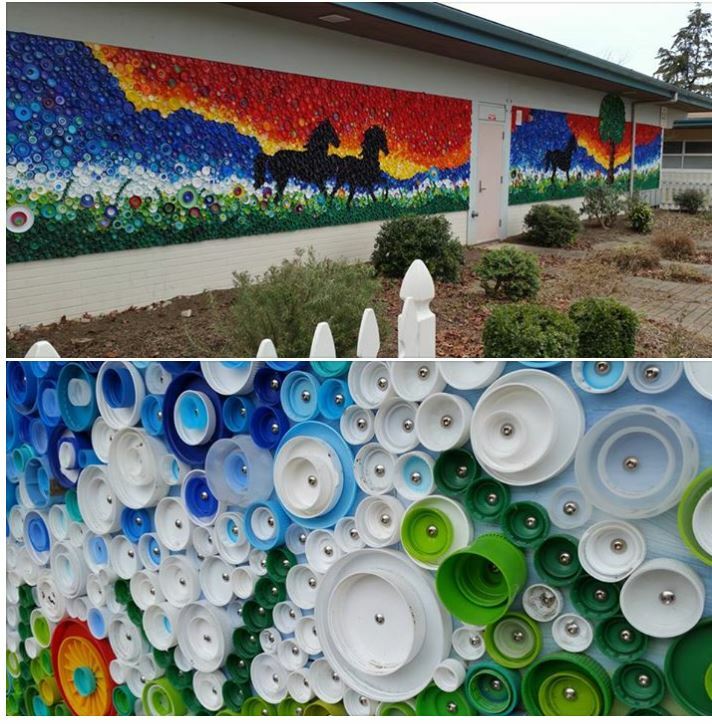 Very cool community mural from our friends at Moorlands Elementary PTA that was made of bottle caps. It was recognized by WSPTA as "gold" for a PTA taking significant action in their community. Granting funds to a Northshore school/Northshore School District and allowing them to make the purchase helps to protect the PTA/PTSA from liability. It also removes the PTA/PTSA from responsibility for maintenance of the item. If items or services purchased by the school or the district cost more than the maximum amount stated in a grant agreement, the granting PTA/PTSA unit is not required to pay the extra cost. The PTA/PTSA may choose to write a new grant agreement to fund the additional cost but is under no obligation to do so. It is advisable to carefully research the cost of items or services, including sales/use tax and shipping/handling, prior to entering into a grant agreement. 3) Gifts of Items (use Form C, Hold Harmless Agreement.) The practice of granting money, not items, to the school or school district is highly preferable because it protects PTA/PTSAs from liability. However, in some exceptional cases, PTA/PTSAs may gift items to schools or the District. 4) PTA/PTSA Scholarships. If your PTA/PTSA has a line item in your budget for Scholarships, Office Managers should make a written request to the PTA/PTSA for a specific number of scholarships (anonymous), and this request should be signed by the principal. Once this request is received, PTA/PTSAs can simply write a check to the school office, as if they were the parent, for the scholarship amount. This includes sports, field trips, Camp Cedar Springs, and other programs for which your PTA/PTSA has agreed to offer scholarships. A sample form is provided for your use.